NWANDO ACHEBE, the Jack and Margaret Sweet Endowed Professor of History, is a multi-award-winning historian at Michigan State University. 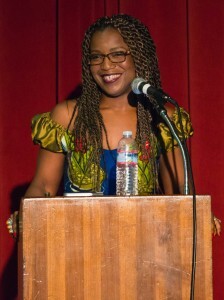 She is founding editor-in-chief of the Journal of West African History. Achebe received her Ph.D. from UCLA in 2000. In 1996 and 1998, she served as a Ford Foundation and Fulbright-Hays Scholar-in-Residence at the University of Nigeria, Nsukka. Her research interests involve the use of oral history in the study of women, gender, and sexuality in Nigeria. Achebe is the author of six books. Her first book, Farmers, Traders, Warriors, and Kings: Female Power and Authority in Northern Igboland, 1900-1960 was published in 2005 (Heinemann). Achebe’s second book, The Female King of Colonial Nigeria: Ahebi Ugbabe (Indiana University Press, 2011), winner of three book awards—Aidoo-Snyder, Barbara “Penny” Kanner, and Gita Chaudhuri book awards—is a full-length critical biography on the only female warrant chief and king in British Africa. Dr. Achebe is co-author of the 2018 History of West Africa E-Course Book (British Arts and Humanities Research Council). She is also co-editor, with William Worger and Charles Ambler of A Companion to African History (Wiley-Blackwell, 2019), co-editor with Claire Robertson of Holding the World Together: African Women in Changing Perspective (Wisconsin University Press, 2019), and last, but not least, sole-author of the forthcoming Ohio University Press’ Female Monarchs and Merchant Queens in Africa. Achebe has received prestigious grants from Rockefeller Foundation, Wenner-Gren, Woodrow Wilson, Fulbright-Hays, Ford Foundation, World Health Organization, and National Endowment for the Humanities. Event made possible by UCLA Library. Reception immediately following the Q & A catered by Sumptuous African Restaurant. Cost : Free and open to the public; pay-by-space and all-day ($12) parking available in lot 3.